For some reason children are the only ones allowed to indulge in play, according to society. Teenagers and Adults who attempt to engage in some form of childhood play are dismissed as unproductive, self-indulgent, and immature; and are told to ‘grow up’ and be more responsible. And, sadly, the City seems to agree by its construction. Sure, there are hundreds of playgrounds, but how many are adults allowed to use? Let’s take a look at an example that will reflect the city at large–Central Park. 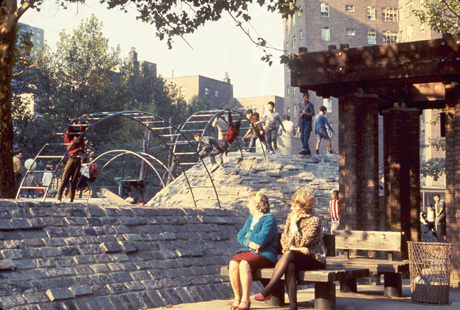 In Central Park there are 21 designated playgrounds. Of those 21, however, a grand total of 0 are designed for the use of teenagers or adults. (There is ‘fitness equipment’ available for use, but we’ll get into that in a second.) Adults could of course try to creatively re-purpose the children’s playgrounds for their own use, but take heed. Those who venture into children’s playgrounds will most likely be slapped with dirty looks and comments from parents, be questioned of pedophilia, and privy to an outcry of concerns for the safety of the children. Oh, and did I mention, they probably will get a ticket too? Most of the playgrounds citywide allow adults only when accompanied by a child under the age of 12. (1). Thus get caught trespassing sans-children and risk getting a citation. (Re: Women ticketed for eating donuts, Men ticketed for playing chess) Welcome to your NYC Playground! Yet, for those of us who do find ways and places to regularly engage in play, there is no doubt that we are rewarded with a better quality of life. Beyond the obvious increase in physical fitness & health, we also find that our stress levels drop, we learn to engage and interact with others more easily, and we begin to see opportunities in places we would otherwise have overlooked. Play contributes to our development as individuals. And of course the City has woken up and taken notice of the importance of getting up and out on your feet (2). NYC annually provides numerous campaigns, programs, and facilities to assist adults (and children, of course), in building & leading an active, healthy lifestyle. However, they seem to be running up against the same wall with each solution. A gym is not the same thing as a playground, and does not offer the same set of complex benefits. Thus there is no denying that in the City and Society today, there is a unacceptable and near complete lack of opportunity for teenagers and adults to engage in free, unstructured, creative play. When you go to a park, your options are to walk, on this path or that one, or to sit on a bench, in the shade or the sun, or to buy a vendor hot dog & people watch. There are tons of bike paths if you’re able to afford a bike, or you could throw a ball in the field, if you’re allowed on the grass, so long as you don’t disturb your neighbors. And, well, with those as your best options, it should be no surprise to hear that in NYC more than 1/2 the adult population is either overweight or obese(4)(5). One could easily tie to the cause the fact that the opportunities that are available to get moving are too expensive, difficult, competitive, or, to put it plainly, not a whole lot of fun. Fitness & play needs to be more than gym workouts, expensive specialty classes, long walks in the park, and competitive team sports. To put the long story short–we don’t need more gyms and classes in our city; we need more playful, adult infrastructure. We need infrastructure that is complex, inter-generational, and flexible, that allows adults & teenagers to develop and explore their own open-ended challenges. We need a place that is safe, welcoming, accessible, and fun. …And We need to stop looking at play as a distraction or diversion from reality, but rather as an integral element of our continual, healthful development. 1 “§1-05 Regulated Uses.” New York Parks & Recreation. NYCDPR. Web. 20 Mar 2014. <http://www.nycgovparks.org/rules/section-1-05&gt;.